Home Thoughts Opinions Iran- Solana Incentives: An Engineered ‘Cat and Mouse Game’? Iran- Solana Incentives: An Engineered ‘Cat and Mouse Game’? This letter was written by Khomeini immediately after he received a “catastrophic” report by his Guards commanders that they will definitely lose in any war, with the military capability limitations of the Islamic state. Predetermined cat and mouse game to get the bomb. Reviewing facts only highlight a catastrophic mistake repeated over and over, by so called European “appeasers.” The same policy of appeasement which emboldened Hitler leaving millions dead and maimed and billions in ruin is proving wrong once again. This time how ever the “collateral damage” caused by appeasement will affect every one of us, world side instantaneously. The Iranian regime is steadfast in acquiring the Bomb and portrays no sign implying the contrary. It began the project as early as 1981 and will not back down. As depicted in Khomeini’s letter to his commander in chief, the tyranny has no other option on the table other than a “killing machine “powerful enough” to keep the State afloat. Press reaction of recent visit of Mr. Solana to Iran, was a combination of bitter mockery and a reflection of a predetermined decision to engineer a “cat and mouse game” that will provide the Mullahs enough time to realize their ambition. Illegal nuclear activities of Tehran had long been disclosed by the Iranian opposition (PMOI/MEK), but were neglected by policy makers. 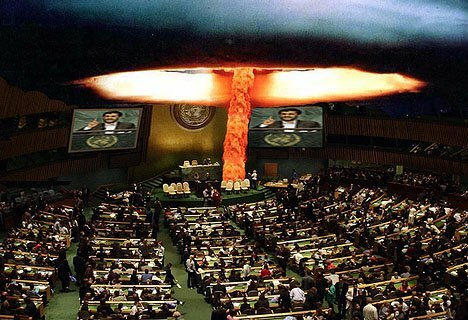 On 24 February 2008 the same group (PMOI/MEK) announced in a press conference that Iranian regime’s nuclear weapons program has entered from “Readiness” to “Deployment” phase by establishing a center for command and control to obtain a nuclear bomb. Mr. Mohammad Mohaddessin, Chair of the Foreign Affairs Committee of the NCRI revealed that a new center known as “Field for Expansion and Deployment of Advanced Technologies” has been setup since April 2007 in Lavizan-2 site to replace the old center which was established in 2004. The Iranian regime denied the information and delayed IAEA inspectors’ visits to the site. The site was finally inspected in 2003 and centrifuge machines were found at the site. The NCRI, exposed a heavy water production plant in operation in the city of ARAK. Iranian authorities declined to respond until several days later, when it managed to remove some installations, rebuilt segments of the buildings of the site and removed the top layer soil of the plant. Iran stalled IAEA visit until alterations had finished. Later comparing satellite pictures proved the NCRI revelations as accurate. The PMOI revealed a centre for testing centrifuge machines and repairing parts in Abali, which operated under the pretext of an Electrical company. Upon visiting the factory, IAEA inspectors found traces of highly enriched uranium. During the Khatami’s presidency, the Ministry of Defense formed a new biological weapons center to work on a biological bomb. That was called Malek Ashtar University, based in Lavizan-Shian Technological Research Center. The Iranian regime razed the building saying that Tehran Municipality owned the property and decided to turn this military site into a park! Considerable delay in the inspections allowed Tehran to raze the entire site and remove soil. The nuclear site in Lashkar Abad, near Karaj was exposed. The name of the company that did the construction (the front company used), Nour Afza Gostar. Tehran first showed the IAEA a nearby site to prove the NCRI wrong; however, they eventually showed the IAEA the real site. As the result of revelations and the final visit of the inspectors, Tehran had to stop operations at that site. The PMOI revealed centrifuge operations carries in Kolahdouz site where the Defense Industry Organization hid a number of containers related to the pilot facility in a warehouse about 2,000 square meters. It turned out that by the time the inspections took place, the regime had moved the containers, and IAEA inspectors were taken to a similar area in the vicinity. The role of military units and the Revolutionary Guards in uranium enrichment was revealed, in which they had dedicated a several hundred million dollar budget for the project. IAEA visit testified that a major portion of the centrifuge production is done by the Ministry of Defense, whereas Tehran had claimed that activities had a peaceful nature. NCRI exposed the dedication of 400 nuclear experts to the Military Industries, exposing the new Center for Readiness and New Defense Technology (Lavizan 2). Tehran refused to allow inspections of this site. It appeared that the equipment from the razed Lavizan site has been moved to this site. 16 billion dollars was dedicated to nuclear technology, purchase and smuggling of Deuterium from Russia, details of the Atomic Energy Organizations’ front companies was exposed in a conference by the NCRI. No action was taken to stop the smuggling of deuterium. PMOI exposed a new activity, Laser Enrichment at the Center for Readiness and New Defense Technology (Lavizan 2), the equipment from razed Lavizan site had been moved to this site for new operations. NCRI exposed Tehran’s program for long range missiles and production of nuclear and chemical warheads, at Hemmat Missile Industries. Details pertaining to Polonium 210, Beryllium and the names of the units and experts that were working on the project in Lavizan 2, as well as a front company, Majd Gostar were exposed by the NCRI. NCRI Exposed the laser enrichment center in a hidden tunnel in Parchin. Tehran refused to allow complete inspection of the site. NCRI revealed that the mullahs had produced some 4000 centrifuge machines installed in Natanz, without declaring them to the IAEA. It was revealed that the Mullahs had produced thousands of centrifuges in military industries, none of which have been declared to the IAEA. It was revealed that the regime had tried to smuggle Tritium from South Korea, a substance that could be used to boost nuclear explosions in atomic weapons. The IAEA declined to comment but South Korea later confirmed Iran had attempted to acquire tritium. Meeting between Abdul Qadeer Khan, and commanders of the Iranian Revolutionary Guards in 1986 and 1987 in Tehran; was exposed, and later it was disclosed that Tehran was reengineering the nuclear capable cruise missile Kh-55 secretly obtained from Ukraine. NCRI revealed that Iran had built several tunnels, some in the military sites including Parchin, to hide its nuclear weapons program. Iranian Regime executed plans to start uranium enrichment at the Natanz site. This was revealed in press conference and denied by the Iranian authorities. So far the NCRI has held at least 150 press conferences in relation to mullahs’ activities. As clear as it may seem, much had been exposed and hardly taken seriously. This time, states of events have evolved into a new phase and developments would take a new velocity to be effected. Unfortunately any wrong step would have world wide consequences. The big Qestion is: When will the world community have to pay for mistakes of appeasers? S. Azad is a freelance commentator who writes to be informative and educative and loves to receive feedback.